Please visit us at www.gumby.com for the latest news about Premavision/Clokey Productions and Gumby. San Luis Obispo - October 12, 2011, we celebrate Gumby creator Art Clokey's 90th birthday, and Google is honoring this stop motion pioneer with a doodle. Google's home page will feature a unique interactive stop motion clay doodle created by the Clokey Productions Premavision studios. Coinciding with the birthday fanfare is the premiere of the new GumbyWorld.com website-Gumby's new home! "The Google Doodle is the perfect tribute to my fathers work," says Joe Clokey, Art Clokey's son and creator of Gumby's new website. "Art's life and film career were ahead of their time. My dad would have been thrilled to be connected with Google in this way." A true visionary and pioneer, Art Clokey touched millions around the world with his creations. Art's clay animation short Gumbasia expressed an exciting kinesthetic brand of film making that has influenced many of our current leading directors. The new GumbyWorld.com website is rich with new, classic and rare film clips, pictures, biographical information about Art Clokey's formative years along with an in-depth look at his five decade long run of his cutting-edge film making. From the Adventures of Gumby and Davey and Goliath to surrealistic art films, Art Clokey had a fascinating and influential career. The new website GumbyWorld.com is the most comprehensive look ever at the iconic green clay boy and all of the other characters in Art's limitless universe of imagination and artistic expression. Included are clips of Art Clokey talking about the creative process and a look into some of his lesser known pilots. Gumby and Art Clokey, two American originals. Renowned animator Anthony Scott created the doodle animation. Scott is known for his animation direction and supervision on Coraline, Corpse Bride and The Nightmare Before Christmas. 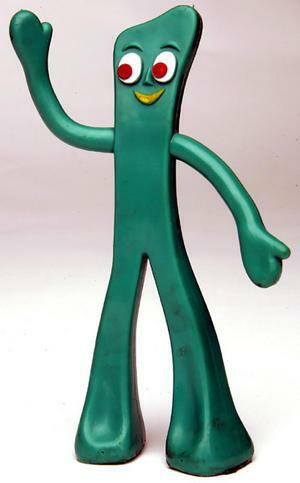 Scott got his start in animation working on the 1980's Gumby series, under Art Clokey himself. He was also the lead animator under the direction of Art's son Joe Clokey on the Davey and Goliath Snowboard Christmas movie, which was released in 2004. Gumby lead puppet maker Nicole La Pointe-McKay modeled the various characters for the Google animation. For more information about Gumby, Premavision and existing licensing opportunities visit www.gumbyworld.com. The Creator of Gumby and Davey and Goliath has passed at the age of 88. Art loved children and gave the child in all of us an amazing gift in the Adventures of Gumby and Davey and Goliath. His wish was that Gumby would live on and be seen by future generations. Art's life was recently chronicled in the award winning film Gumby Dharma which aired on PBS and then the Sundance Channel throughout 2008 and 2009. It was an amazing life of giving and learning and creating. Yes, the elusive but much requested Gumby Vs the Astrobots clip is now relinked here! Gumby comic series wins prestigious "Eisner"
Gumby comes to St. Louis! April 15th. KQED in the S.F. Bay Area 6:00 p.m.
Sneaky Pete Kleinow Has passed away. Gumby's theme song. We will miss him dearly. Gumby through the years and Gumby Dharma are arriving in Seattle! Check out this link and scroll down to Gumby. This event is not to be missed! make it well worth the drive. Need some cool wallpaper, ringtones, or video games for your cell phone? Great Gumby exhibit through August near Seattle. in "First of the International Clayboys: Gumby and the Animation Legacy of Art Clokey"
compilation will screen in Los Angeles Wednesdays to Sundays at 1 p.m.
Merry Christmas from Gumby and Pokey! Numbered and signed; each pair comes with a case, and a studio certificate that includes the history of the puppet. "Gumby at Pixar" The Good folks at Pixar saw a sneak preview of the movie "Gumby Dharma". Artists from five decades all join Art Clokey for a great party. Check out the latest with this Press Release from the Museum of the Moving Image. Check out the latest article on the 50th anniversary as reported in USA Today. Gumby and Friends 50 Great Years! Art Clokey, creator of Gumby, will attend the reception, sell and sign bendable Gumby and Pokey Toys to the first 100 attendees. Later in the evening a film honoring the 50 years of Art Clokey's career will be shown at the El Campanil Theatre starting at 7.00 pm. Behind the scenes with the Astrobots! The L.A. Avengers Pro-football team had a fun Gumby night. Click the picture to see the large version. Would you like to see Gumby back on TV? If so, please sign this petition. Have you ever wondered when Gumby would be available for a video game? Well, check out this news release from Namco the wait may soon be over! January 5th, 2005: Gumby is in Japan Too! May 28, 2004 Gumby and Pokey play some serious soccer! See the Action! May 26, 2004 Check out this promo trailer for Gumby's first movie. this clip is for Real Player, please be patient while it loads, if you would prefer a differnt player or settings please click change settings. Robina Marchesi is currently in post production on an exciting new documentary titled Gumby Dharma: The Life of Art Clokey. It is one of the most interesting documentaries out there. Art's life is full of surprises, and Robina has been given full use of the extensive vault of footage from Art's life, including footage Art took in the early 1930's all the way to his current Davey & Goliath and Gumby projects. Gumby and Pokey even have a say in telling Art's story. We are also in pre-production on Gumby's next feature film. We're on the cusp of getting a major distributor. It's going to be the best Gumby ever, and it's production quality will be Chicken Run quality. Stop motion has never looked so good. Our studio is in full production of a one hour TV Special called Davey and Goliath's Snowboard Adventure. It's the most exciting Davey ever. The scope of the adventure is going to really be fun for all stop-motion lovers. The story is about religious tolerance and God's love. Go to http://www.daveyandgoliath.org to see some production stills we've taken. Gumby and Pokey are going to be in the Rose Parade this winter. A 45 foot long float with flowers and plant parts making up a huge Gumby and Pokey. We'll keep you posted as it gets built. Welcome to the Clokey Productions and Premavision Animation Studios Website! Clokey Productions and Premavision Animation Studios have been specializing in stop-motion animation for 60 years with television shows like Gumby and Davey and Goliath. Explore the history of the studios here. Copyright © 2011 Prema Toy Inc. and Premavision Inc.